Aqua Vac introduces the newest addition to their TigerShark line; the TigerShark QC, featuring patented Quick Clean technology. 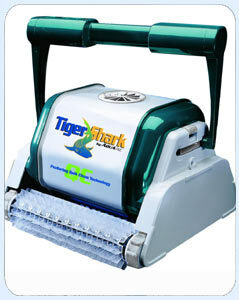 The TigerShark QC can clean any shape, size or type of standard residential pool in 60 minutes. Designed with a more efficient cleaning pattern allowing for quick clean ups in between standard cycles while still reaching all points of your pool. Simply place it in your pool, plug it in, the Quick Clean Cycle is on and your pool will be noticeably cleaner in about an hour or the TigerShark QC gives you the option to choose the standard cleaning cycle for heavier dirt or debris. It uses less energy, requires no hoses or hook ups and clean up is easy with the patented filter cartridge system. The TigerShark QC comes standard with a 3 year unconditional warranty which is unmatched in its category. Filter Micron Porosity/Area Filter element, 5 Micron/1000 sq. in.